Waste Recovery ~ The case for composting. Organic waste, such as kitchen waste and garden clippings need not end up in the rubbish bin. A large part of household and commercial waste consist of valuable organic materials (about 30% or 442,000 tonnes/annum) that could be made into compost. Composting is a valuable process for the treatment of aorganic wates and should be encouraged as a viable alternative to diposal. There is no mystery about making compost. 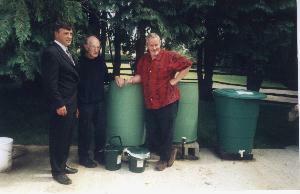 Composting can be performed either by households or in large-scale centralised unit. Eugene Scally, Donal Hayes and Michael Lynch. Michael Lynch gave a very interesting talk on how to get rid of your kitchen waste with worms. For households concerned about the environment and solving the waste problem, the compost heap provides a simple "recycling pot" for kitchen and garden waste. With a properly functioning compost heap< the amount of waste left out for collectioning can be significantly reduced. There are many ways in which you can make a compost heap. If you have never tried, why not give it a go?? ?